What does the study of Bible prophecy give the Christian? 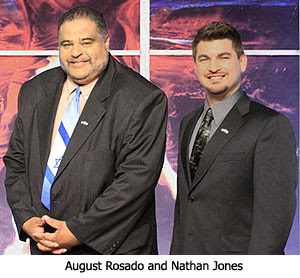 On Saturday, November 19, 2011, I was interviewed by host August Rosado of the BlogTalkRadio show Signs of the Times. August is a Bible prophecy teacher and preacher and founder of a ministry called Today in Bible Prophecy. He has and continues to be a personable guest on our television program Christ in Prophecy. He and I shared a number of the blessings the study of Bible prophecy gives the believer in Christ. August Rosado: In Daniel 12:4, God told the Jewish prophet Daniel, "But thou, O Daniel, shut up the words, and seal the book, even to the time of the end: many shall run to and fro, and knowledge shall be increased." I believe that is our generation that the angel was talking about to Daniel. So, Jesus must be coming back really soon. Nathan Jones: Oh, amen, Brother! That's the primary message of Lamb & Lion Ministries. We want people to get excited. You know how at times it feels like the Lord is never going to come back, that He is never going to keep His promise that He will return like He said at His Ascension? Well, I can understand how people give up and they grow lax and they grow lazy. But, if you believe and understand that Jesus is coming back, it gives us hope for a great future while living in this dark, dark world. It gives us a purpose for living because we now know we need to evangelize to the best of abilities. Jesus' soon return gives us a future hope. It's the hope in that we know the Lord will return in victory. We should also respond to the knowledge of the Lord's soon return by living holy lives. I have little kids, and occasionally you come across them when they are doing something they're not supposed to be doing. When caught, you know how they can give you that oh so guilty look? Well, I don't want to be like that when the Lord comes back. When the Lord comes back I want to be doing the right thing by serving Him. So, understanding Bible prophecy gives us the motivation to live holy lives while anticipating that the Lord could return at any moment. August Rosado: That's right. When you just mentioned that truth I was reminded of what Paul said in Titus 2:11-12 he said, "For the grace of God that bringeth salvation hath appeared to all men, teaching us that, denying ungodliness and worldly lusts, we should live soberly, righteously, and godly, in this present world." The grace of God offers salvation to all people. It teaches us to say "No" to ungodliness and worldly passions, and to live self-controlled, upright and godly lives in this present age. Then Paul says in verse 13, "Looking for that blessed hope, and the glorious appearing of the great God and our Saviour Jesus Christ." So, Bible prophecy motivates us to live holy. It motivates us to live lives that are godly in this present world. Bible prophecy puts the fear of God in us, knowing that Jesus can return at any moment. Bible prophecy is a third of the Bible. That's 31% of the Bible that's about prophecy. And yet, so many people because they don't want to study or they think it is too difficult just ignore it. But, you just can't ignore 31% of the Bible. That'd be like reading a book and forgetting what you read, or not even reading the last third of the book. How would you know how it's going to turn out? How was the mystery solved? Did the good guy win, or did he lose? Well, that's what Bible prophecy gives us. It gives us the thrilling ending to the book. The ending of the book tells us that Jesus will return. Jesus will defeat His enemies. He will cast Satan into Hell one day. And, those of us who put their faith in Jesus Christ will live with Him forever in eternity in His home the New Jerusalem which will be brought to earth. Wow! Bible prophecy even tells us what our destination is. Bible prophecy tells us what our relationship with Christ will be. And, Bible prophecy gives us hope that all the wickedness that we see now will finally end. Now you can see why Dr. Reagan and me and you August are infectious with excitement, because Bible prophecy gives us so much hope and anticipation for the future. In the next part of this Interview by August, we'll come up with some theories on why some people have given up on Bible prophecy. I can never get enough of hearing the message of the imminent pre-trib Rapture. It truly is my blessed hope! Im so excited i know what maranatha means now!! I say it outloud often! :) because of the blessed hope of the REALITY of the imminent rapture, im able to enjoy true peace and true love that can only come from the Lord! I was reading psalms 91 this morning.... praying that somehow i could see israel someday.. (as i always yearn for) and the Holy Spirit came over me and spoke to my heart reminding me " susie! Dont fret!!! Remember... i am coming so quicly and yoh WILL be seeinv israel soon! Im taking my bride there MYSELF!!!!!!!!!! YAY!!!! Psalm 91 was my dad's favourite Psalm. Oh that I could be greedy and see Israel yet again. DrNofog’s wife came home late Monday afternoon and has been doing well, has lost 25# of fluid to date. He said to tell everyone‘hi & God bless’! P.S. How is Dr. Reagan doing? I came across this piece from Mal Couch I found to be a sobering and thought provoking ‘sign of the times’. It is being taught in Emerging churches that when a man marries, he has to leave/reject his parents and cleave only to his wife. I don’t object in a man putting his wife first, but Scripture in Matt 19:3- 9; Mark 10:1-9; Eph5:22-33 is warning against sexual sin in marriage, not the abandoning of parents. Paul reminds us of what the apostasy will be like. That apostasy is now coming upon our generation, and it will only grow worse. He writes: "But realize this that in the last days difficult times will come" (2 Tim. 3:), "for men will be lovers of self … disobedient to parents" (v. 2). In the Greek text it better reads "They will not comply with parents," "They will reject, withhold belief in," "Will not be persuaded about parents." This is a growing problem even among Christian families, with the younger generation refusing to listen to what the parents say. While it can be happening among children and grandchildren who are younger, Paul starts this section out with saying "For men ("anthropos") will be lovers of self ..." So Paul is not just addressing the issue of teenagers but of those who are older, who are repudiating the wisdom and the words of their older parents. If he were writing about younger people, or teens, he would probably used the Greek word "teknon" (children). But he used the word describing grown men. By using "anthropos" some believe Paul could be referring to mankind in general not just men ("andros"). In other words this will be the state of humanity in general. It will be the ongoing tendency of culture as a whole! Society is changing rapidly and it will not turn about. This is the state of apostasy that is destroying our world. The judgment is coming—the seven year period of tribulation or wrath. The blessing is that the church will not go through that terrible period that we can now see on the horizon. Thank you for the comments about the rapture. I have always been on the fence about if the church goes through 'God's Wrath'. I have tried to grasp it and finally have used a simple example to help me. Here it is: as a teacher has a classroom with rules and expected behaviors of the students to help achieve the best learning environment- so has God set up laws and supreme ways for our best. Then when a student doesn't follow the rules the teacher doesn't punish the whole class but only the individual or group that has done wrong. So in my simple mind I see that God will not punish with His Divine Truth/Wrath the 'church'. I finally see it. I finally believe it. God is wonderful and patient with the ones that love Him and also tarries because of those who don't. Thanks again for repeatedly explaining the rapture. Don't stop. It gives me and many others great hope. How awesome! AMEN AND AMEN!!!! Praise The Lord! That's another crown reward for the Blessed Hope to cast at the feet of Jesus in worship for all He has done for us! 11.Thou art worthy, O Lord, to receive glory and honour and power: for thou hast created all things, and for thy pleasure they are and were created. As far as I am concerned, we know quite a lot about the rewards; but there is so little teaching done on these works of righteousness, that few know about them. They have been wrongly muddled into conditions for Justification, whereas they are linked to Sanctification. They are to do with our walking in the Holy Spirit, denying self and obeying Jesus commands are like gold, silver and precious stones that will survive the judgment fire. Otherwise deeds done in the flesh, even good deeds, are hay, wood and stubble that will perish in the fire. It’s how we build on Christ the foundation stone. It isn’t our salvation that is burned up, its dead works/fruits Eg read 1Cor 3. As I am having problems with arthritis in my hands. I will wait in the hope that Nathan will come up with an article done by Dr. Reagan. I will jot things down as I can. Anonymous, it warms my heart to hear that our teaching about the soon return of Jesus Christ has been a blessing to you! That's why Lamb & Lion Ministries exists. For information on why I believe the Pre-Tribulation Rapture is the best argument for the timing of the Rapture, please check out these articles on our website here and here and watch our Christ in Prophecy episodes. DrNoFog, so good to hear your wife's back and is improving! Dr. Reagan has two blood clots that we're all praying the blood thinners will dissolve before they break free. For a man who's a workaholic, what's extremely frustrating to him is that this is keeping him from his work. Please pray that the clots dissolve and for a spirit of rest to be on him. Thank you! Susie, hope my past article Your Crown In Heaven and FHCO: Your Future in Heaven (Part 4) helps you with your question about rewards in Heaven. Nathan im praying for dr reagan. And thank for the links. You got it right! The Rapture is all about giving people hope. We are NOT subject to the wrath of God in the tribulation! We get to escape it.